The bunny chow: a dish ingrainedÂ in the fabric of South African culture. So much so that its successor, the kota, has been credited as one of the leading causes of obesity in school children, writes ANGELO C LOUW. It owes its origins to the Indian indentured labourers who arrived here in the late 19th Century to be put to work on sugar plantations. Long before Tupperware, their wives would pack leftovers in hollow loaves of bread for them to carry to the fields. Bunny chowâ€™s origins story is one of resilience and ingenuity. It demonstrates how previously disadvantaged people have had to make due in substandard living conditions. One would never guess the loaded cultural significance of the dish while pigging out at the local corner takeaway. I shouldnâ€™t be shocked, really. Contemporary South Africa has made a habit of writing Indian people out of our cultural narrative; you would swear that the Indian diaspora has made absolutely no positive contribution to our heritage or to the development of our nation. It is as if they just arrived off a boat at Durban Harbour. Popular â€œGo back to Indiaâ€ chanting at political rallies or in social media posts is evidence of that. A consequence, I believe, of media coverage of former president Jacob Zumaâ€™s illicit relationship with a particular Indian family who almost recolonised the country. I am not saying that the media shouldnâ€™t do its job â€“ thank God it did its job, actually â€“ but what is left is an image of Indian people as corrupt, self-serving and destructive to the masses. All people see, now, are mini Guptas waiting to steal and rob and control. Every Indian is suddenly classed in the same category as the (presumed) illegal Somali immigrant opening a shop on the corner, selling (presumed) backdoor goods at prices cheaper than Checkers. Every Indian is assumed to have arrived with the Guptas. The truth of the matter is that Indians have been around â€“ a lot longer the 150-year period always cited. 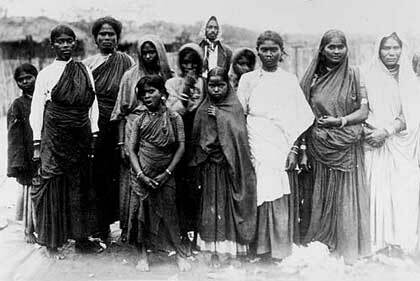 Indians were of the first slaves to arrive in the Cape, but their slave heritage is always overshadowed by the indentured labourer narrative, which will have you believe that their arrival in South Africa was by choice. You almost never hear about this, not even when you visit the Imbizo Slave Lodge in Cape Town. In fact, this account of their history is practically limited to single webpage on SA History Online. This type of omission is mirrored throughout South African history, where Indians were often positioned as allies in the anti-apartheid struggle, but never champions. It is as though they had nothing to struggle against. We never hear about their subhuman categorisation under past oppressive regimes and the brutally they faced. There are no accounts of how they were often referred to as â€œkaffirs met hare [with hair]â€ or the other k-word that still finds its way public dialogue because â€œthatâ€™s just what they are called in African languagesâ€. Weâ€™re definitely not having conversations around reparations – the types of conversations that other slave populations around the world are having, most notably in the West Indies. Economists are not bothered to work out how much Indians have contributed to South Africaâ€™s economic growth, or the compound impact of their labour. It is easy to buy into the Gupta narrative because it is almost the only point of reference that exists for public consumption. It is very difficult to imagine their place in society, and just how deeply their roots run, because of how much we do not know. Angelo C Louw is the advocacy officer at Studies in Poverty and Inequality Institute (SPII). He is also a Fulbright/Hubert H. Humphrey Fellowship 2016-2017 awardee. He writes in his personal capacity.